Recent years have seen a surprising shift concerning the concept of self-esteem. For example, some researchers attacked the notion as being of little value or too difficult to study. Educators emphasized self-esteem's importance in schools to the extent that sometimes it became more important than academic performance. And a parade of overly-simple and ineffective self-help books promote the importance of self-esteem but seldom deliver real change. 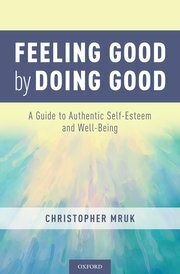 Coming to the defense of self-esteem as a valuable and measurable component of good mental health, Feeling Good by Doing Good offers a new evidence-based approach to defining, understanding, and increasing what is known as "authentic self-esteem." Translating decades of research in the fields of self-esteem, humanistic psychology, positive psychology, and psychotherapy into everyday terms, Christopher Mruk traces the definition of self-esteem back to when it was first used to describe the value of "doing that which is both just and right." Seen this way, self-esteem is not just feeling good about oneself - rather, it comes from facing life's challenges in ways that demonstrate one's competence and worth as a person. Click here to go to the publisher's web site for further information.